Inmates at a new mixed prison in Cambridgeshire are to be offered massages and relaxation treatments. Operators of the 840-place Category B prison at Peterborough, United Kingdom Detention Services (UKDS), want to recruit two holistic therapists. 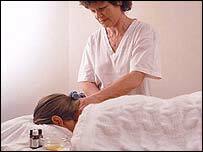 Reflexology, aromatherapy and Indian head massage would be offered. Peterborough MP Stewart Jackson has accused the prison of pampering inmates and sending out the wrong message to hard-working families. Mr Jackson said: "It is wrong prisoners are treated in this way. Are they using it as a Butlins holiday camp? "It reflects badly on hard-working families in the city that prisoners, men and women guilty of committing serious crimes, are being pampered instead of punished. "Inmates should be taught the basic skills, such as reading and writing, to aid their rehabilitation." But UKDS spokesman Nicholas Hopkins said the treatments, from the two part-time therapists, would not be offered to all inmates. "We will be working alongside other health-care operators to assess whether certain prisoners are considered suitable for alternative therapies," he said. "Part of the prison's role is to assist prisoners, whether that is helping with educational difficulties, vocational skills, drug dependency or self-harming. "Indications from other establishments have shown that there are prisoners for whom this would be an excellent alternative treatment."